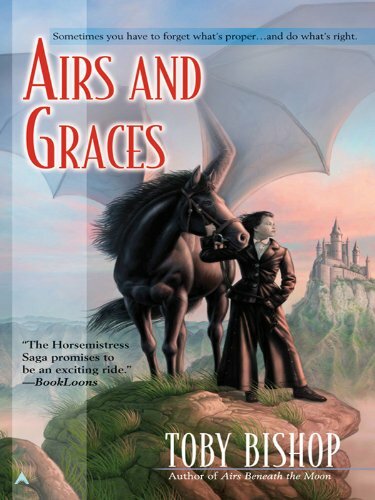 Larkyn Hamley, the free-spirited country girl who accidentally bonded with a winged horse, is in her second term at the Academy of the Air when the savage Aesks attack a northern village. The Duke refuses to respond, and Larkyn and her beloved teacher, Horsemistress Philippa Winter, find themselves in direct conflict with Duke William as chaos threatens the Duchy of Oc. Philippa’s career, and even Lark’s life, hang in the balance. "Strong character development, politics, and magical horses all add up to what promises to be a lively and engaging trilogy." "Bishop enables us to visualize the horses in solo flight and complicated formations, scenes at the academy are utterly real, and the characters have dimension. A thoroughly satisfying read." "The Horsemistress Saga promises to be an exciting ride. " "The more I read, the more involved and in love I am with these books. They are completely absorbing. The world that is created is so rich and full and real. The characters are wonderfully interesting and well-developed. I feel like I live inside this world and I know these people. This is great fantasy at work. I'm not ready for this series to be done yet, and thankfully it isn't, but I'm not sure I ever want it to end."